Could We Get Robots to Make Babies? Dutch researchers say they have a proof of concept. It might be possible someday to "breed" robots, allowing the robots themselves to select out what traits are most "attractive" in environments with unanticipated challenges. That is the tantalizing idea presented by a research team at VU Amsterdam, who say they have demonstrated a rudimentary proof of concept. The vision is that robots could someday use evolutionary-type processes to create better versions of themselves for deep sea mines, other planets--or perhaps even the human body. "Evolution is a great designer. The Evolution of Things is an emerging new technology that exploits the power of selection and reproduction to breed robot designs that are hard to obtain by traditional approaches. Robots that evolve can adapt to their environment and cope with unforeseen situations," Guszti Eiben, an artificial intelligence professor at VU Amsterdam who led the team, said in a news release. The Dutch research team created a "Birth Clinic" with a 3-D printer, a "Nursery," and an "Arena" where the toy-like robots live, work, and reproduce. The robots have a motivation to go toward a red light and "mate." 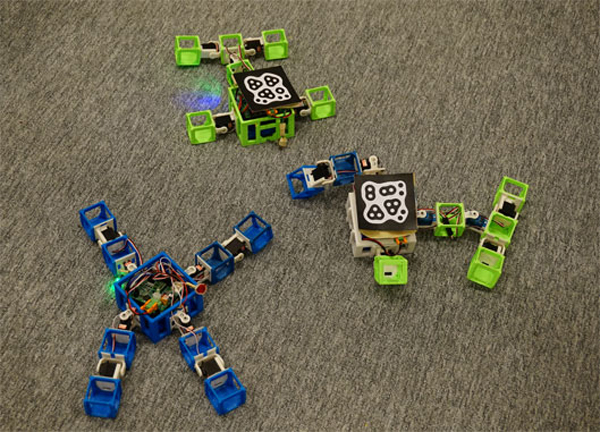 Mating actually involves the robots uploading a combination of their physical traits to the 3-D printer in the nursery, as well as a combination of their software. "The bodies, brains, and behaviors are continually tested by the environment and the useful traits are amplified in future generations. This technology opens new perspectives for robotics, artificial intelligence, space research, and even biology," Eiben said. During a 2011 TED talk, Eiben even brought up the idea of self-reproducing medical nano robots inside the body that could act as a "personal virus scanner" to fight germs and cancer cells. Eiben over email acknowledged that the concept, while technically a no-brainer, is ethically problematic: "Some people are OK with self-reproducing and evolving robots on Mars, but not with such things in the human body."